Based on the inputs received from the client, the wing geometry was developed using CAD modeling. 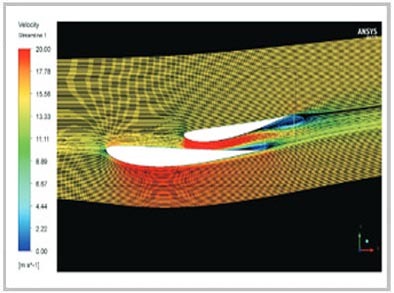 Large atmospheric domain was developed around the wing geometry and axisymmetric approach was applied to reduce computational power and faster simulation. The results in terms of drag and lift forces were identified along with the observation of vortex formation around the wing tip edges. The CAD model of the wing geometry was developed along with a large atmospheric domain to capture the flow physics accurately. 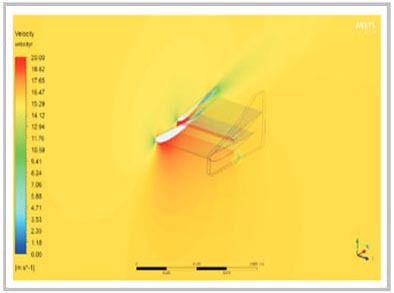 Due to symmetry in the wing geometry, axisymmetric approach was utilized to reduce the computational power and speed up the simulation process. Applying the boundary conditions with suitable turbulence model, the velocity and pressure distribution over the wings were simulated. The results showed the formation of strong wing tip vortices near the side body. The drag, lift and lateral forces were calculated through post-processing as requested by the client.